Satisfy both your appetite and your wanderlust on this fantastic combo tour; indulge in a mouthwatering Greek breakfast, followed by a fascinating tour of the ancient Acropolis and modern Acropolis Museum. Upgrade your tour to Acropolis & Acropolis Museum with a premium Greek breakfast in a cozy, local place, dedicated to offering the very best traditional Greek flavors with unexpected twists. Before your private guided tour, be lead into a small hidden yard of prickly pears in the hottest neighborhood of Athens, Koukaki, and indulge in a full breakfast crafted from innovative recipes from across Greece. Thank goodness I found Greeking.me. Needless to say it was better than I had anticipated especially as Evita was my tour guide. Evita was especially knowledgeable not only about modern Greek culture but also recounted in fascinating detail relavent Greek history and incredible mythology stories. The food and drinks part is simply to die for. Highly recommended and such a refreshing experience from start to finish. Eva provided a fantastic tour that was fun, informative, and at a pace that was comfortable. The Greek breakfast before the acropolis tour was a nice way to start the day and fill up before walking with Eva around the Plaka and the acropolis hill. Food stops were excellent and provided a good overview of common foods that the Greeks eat - some expected and many unexpected. Highly recommend a tour with Greeking.me when visiting Athens. We took the breakfast and Acropolis tour and it exceeded our expectations. We scarfed down pies, yogurt and rice pudding--absolutely delicious. Marialena then met us and the tour began. Also an archaeologist, Marialena was a phenomenal tour guide and knew just where to position us for the perfect picture or to keep us in the shade. She takes great pride in Athens and its history, which made it that much better of a tour. If you want to see the Acropolis, I can't recommend this high enough! We had set up a tour that started with being met in our hotel in Plaka and then go to a beautiful greek shop where we were served a lovely greek breakfast. After a great meal and sincere conversations, we met Marialena who then took us on a fascinating tour of the Acropolis and Acropolis Museum. The Acropolis and Museum, coupled with modern history, and even where all the shade on the Acropolis is. We would highly recommend this service and can't imagine you will find a better option. Rise and shine early in the morning and meet your local expert guide before your upcoming culinary experience. First things first; enjoy a traditional Greek coffee or a freshly made orange juice to gain strength for the adventure of the day. The options for your Greek breakfast are equally indulging; choose savory pancakes made from Naxos potatoes, served with grilled talagani cheese, eggs and thyme honey; or froutalia, a rich and mouth-watering omelette from Andros island, made with sausages and soft volaki cheese; or fried eggs with sygklino, a smoked ham recipe produced in the region of Peloponnese. How could you resist temptations like these? Having perfectly commenced your day, it is time to follow your fun, expert guide on a private guided tour to the Acropolis and the Acropolis museum. Witness in person the extraordinary allure of the Parthenon and its surrounding monuments, exploring the history of the sacred rock through time. Finish your tour with a visit to the Acropolis Museum, where you will travel back to ancient Athens, and admire unique exhibits embedded in a 21st-century class environment. A snapshot of Greek culture, food, and history in just 5 hours! Enrich your experience with a special Acropolis 3D iPad! See with your own eyes the craftsmanship and vision that inspired a civilization and admire the monuments of the Acropolis hill in all their former glory.Prepare yourselves for a time travel back to the 5th century BC! Cost: 15€ per iPad. Skip the Line Tickets - Escape the queues! As an additional, free-of-charge service, we will pre-purchase your Acropolis tickets to ensure that you do not wait in queues. We value your time! If you wish to explore more of the city, we can arrange for a private transfer to take you sightseeing! 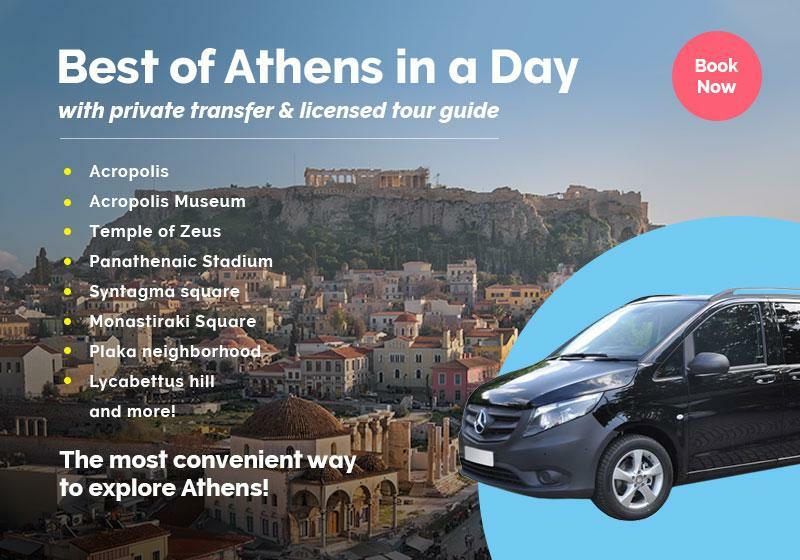 After your Acropolis Museum tour and a refreshing lunch break, hop on to your private vehicle and, along with your guide, admire monuments such as the Panathenaic Stadium, the Lycabettus Hill, the Athenian Trilogy, and more. Please fill in the customize form above and we'll get back to you shortly. The tickets for the archaeological sites -we will pre-purchase skip-the-line tickets for you! The tour is available in English, German, French, Italian and Spanish. Prepare yourself for an exciting walk & don’t forget your hat, sunglasses, sun-block and a bottle of water. Βring along your camera so you can capture the most beautiful spots. Needless to say that wearing comfortable shoes is an absolute must! A pick-up from your hotel can be arranged. Please fill in the 'customize tour' form above. Is it difficult for older people to follow the group? Not at all! We will walk at a moderate pace so it will be a pleasant walk for everyone. We will also make several stops to admire and discuss the fascinating monuments and sites along our way. Very much! Our local expert will provide fascinating info & easy to understand stories about the city that will make this walk an unforgettable experience for your little ones! All services booked through the website of Greeking.me are paid via PayPal or credit card. Once you make your payment, we will issue a voucher & send it to you via email. The "Greek Breakfast Experience with Acropolis & Acropolis Museum Tour" is available as a private tour, in order to further customize your experience to fulfill your specific needs & expectations. Simply tell us your preferences in the booking form below.